OMG, this was a-ma-zing, about an important moment in the history of porcelain making, in England and France, in the 1750s. My most favorite histfic of the year so far. This was a cute quirky novel, highlighting how one apparently small event can lead to dramatic changes in your life. Samuel had no idea that offering milk to a stray cat coming at his door would change his solitary days into a new year of discovery. It felt a bit Japanese, which is interesting, as the author has actually co-authored a book on Ikigai (see below). At a deeper level, I’m not sure I agree with some metaphysical conclusions. Samuel is a linguistics lecturer, so there are tons of references to all kinds of novels by authors from different countries. A quick, charming, and fascinating read. Fascinating, about the Japanese concept of ikigai – a reason for living, as the root of happiness. OMG, what suspense! I’m almost done. This is another great success by Bussi. I’ve been listening so fast to my current audiobook by Bussi, that I’ll need to listen to an audiobook from my library before I can get a new credit on EStories. 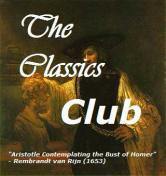 So I decided to go with this classic for The Classics Club. I actually started listening to it during a trip last June, but the trip was not long enough and I never finished it. I’ll be restarting from the beginning. More giveaways on November 15! This entry was posted in Audiobooks, Classics, ebook, Fiction, foreign, French Bingo, Giveaway, Historical novels, I Love France, It's Monday!, Mysteries, Non-Fiction, Now reading, TBR, WWW Wednesdays and tagged Anthony Horowitz, Elizabeth Kostova, Kate Morton, Michel Bussi, Nancy Bilyeau by WordsAndPeace. Bookmark the permalink. good to read your comment Anne! I actually liked the ending. Definitely the type of book where you need to take notes on who’s who! So, what are you reading this week? Great variety of books. I liked the Alex Rider series but haven’t tried his books for adult yet. Come see my week here. Happy reading! I agree about THE CLOCKMAKER’S DAUGHTER. It was very confusing, but turned out in the end. ENJOY your week, and thanks for stopping by my bog. The only one of your books I’ve read is The Moonstone… loved it! I’ve heard the Kate Morton book is confusing to begin with so will have my notebook handy when I get to it! I’ve been wanting to read a book by Nancy Bilyeau for a while. You’ve got me all curious about THE BLUE. Last night I finished Anne Tyler’s first (1964) novel, If Morning Ever Comes. Then I started Margaret Drabble’s second novel, The Garrick Year, 1964. I have been neglecting My Big Fat Reading Project lately because of so many excellent new releases. You have some great books on your list. Enjoy! thanks Yvonne. What are YOU reading this week? The Blue is on my list to read. I am glad to hear it was so good! Have a great week! Love in Lowercase sounds really cute- I like books that explore what happens from a single chance encounter or set-ups like that. Sounds like it would be a fun movie too. yes! that would be a great movie indeed!! Love the idea of the ikigai book – think I need a bit of that in my life! Love in lowercase is really cute. I hope you are not too far on your library waiting list!